​We planned on designing a 10’ Stillwater Classic right after the 10’ Hopper II was perfected. However, the 10’ Hopper II exceeded our expectations and we realized it worked on both stillwaters and Class I and Class II rivers. There was very little we could do to improve this new design. So we left well enough alone! The 10’ Hopper II can be built with one or two seats. If you go with a single seat you can choose the Stiff Floor option (recommended). This replaces a floor layer of woven glass with a bias fabric, adding stiffness and strength to the bottom (lost when the second seat is removed). The 8' Hopper II is the second boat we designed. Over time we improved it's hull and replaced rolled gunwales with Eastern Ash gunwales, which added strength, stiffness and durability. 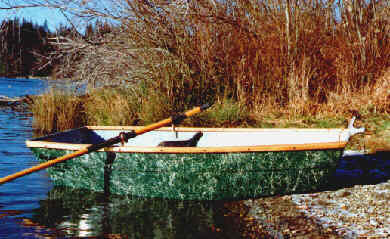 The 8’ Hopper II is designed as a one person Class I & II river pram although it has found a home on stillwaters as well. It has high sides, an asymmetrical bottom shape, very low draft capabilities and shallow rise bow and stern. Our 8’ Hopper II is a favorite of fly fishers who need a larger capacity boat (weight capacity: 250 lbs +) on stillwaters. It carries weight incredibly well. This pram draws about 1” of water based upon the average 180 lb person. Another stability consideration is that on stillwaters, with the high exposed sides of the pram, you can get blown around a bit in higher winds. Adding an anchor system and an 8 lb anchor usually does the trick. 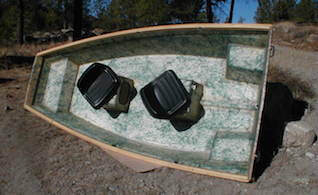 The asymmetrical bottom shape allows for good maneuverability on moving water. For straight tracking on stillwaters, we suggest adding an electric motor. Overall, the 8’ Hopper II is a great boat for slow moving rivers and protected stillwaters.